Recently I’ve been wanting to experiment with more bite-sized, perfect-for-parties appetizers, and have had my eye on a mini muffin pan. While I’m not a huge fan of baking nor am I exceptionally creative in that vein, mini muffin pans seem perfect for making savory, bite-sized party apps. Lo and behold, I got my wish last Christmas and received a shiny new pan, just in time for a party a few days later. 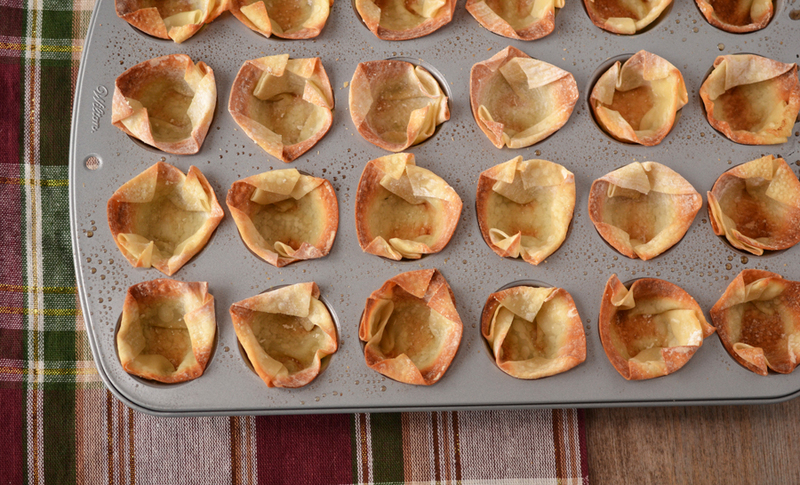 Since then, I’ve experimented with making several different apps that all have the same base – baked wonton wrapper cups. They’re cheap, quick, easy and are a fantastic vehicle for a myriad of fillings, savory or sweet. Use them as a (mostly) neutral base for whatever you can think of, or get creative. For example, have a salad recipe that calls for croutons? Make the salad and leave out the croutons, as the wrapper cup compensates for that. Want to make a bite-sized dessert? Sprinkle cinnamon/butter/other delightful bits on the cups when baking, then add a luscious filling. The sky’s the limit with these. Note that the pictures below are based on the first set of experiments which used wonton wrappers – specifically the square ones you’ll find easily at any supermarket. Since then I’ve determined that it’s best to go with gyoza wrappers – they are similarly-sized, but round. I’ll get to why in a minute. Making these babies is easy – grab a pack of wrappers, add some fat, and bake for 6-7 minutes in a 375 degree oven until lightly browned. I tested this process out Cooks Illustrated-style with several oil options and techniques, and can safely say I think I’ve figured out the best method. I tasted all three versions, and can safely say that the olive oil cooking spray is the best. The bare version had a bit of a chalky/starchy taste that I wouldn’t recommend. Both oil batches tasted equivalent (and honestly not that much of a difference than the bare version, but definitely worth the slight caloric uptake for the spray) – the main difference is that brushing oil automatically equals WAY MORE OIL unless you have a magical brush that I’m unaware of. Even when brushing lightly, a lot more oil gets on there than a light spray of Pam. So for the healthiest and best tasting version, go for a light spray of a product like Pam both in the pan and over the wraps once they’re in the pan. Second, the shape. 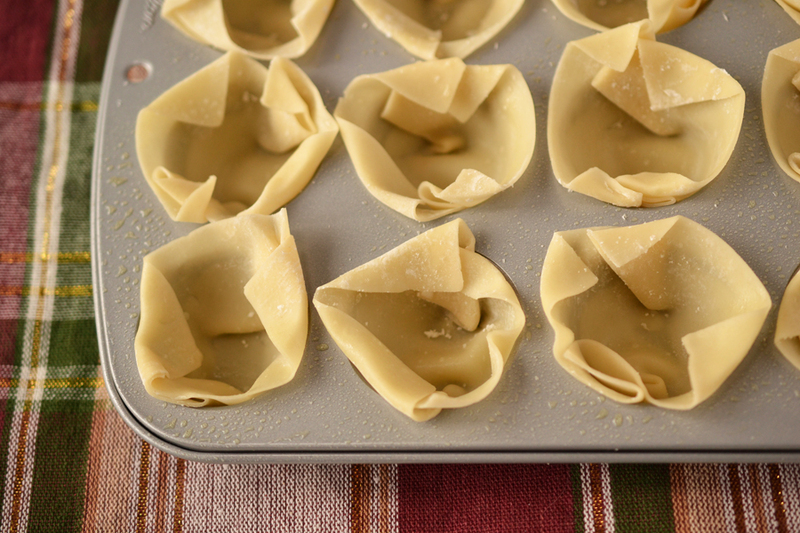 Pretty much any recipe you’ll find on the web for baked wonton cup wrappers look stunning and gorgeous due to the cups’ dramatic peaks. And yeah, they look gorgeous. But I’m here to tell you, they aren’t practical when it comes to eating them. You don’t want to make your guests’ lives miserable, do you? The problem is the wraps, as logic would dictate, get quite stiff and crunchy in the baking process, and even when using a mini muffin pan, generally these are two-bite appetizers, not one-bite. So your guest needs to be able to easily bite through half of the app – the problem is, these jaggedy peaks get in the way, are troublesome to get around without stabbing the roof of your mouth, and add ZERO to the dish flavor-wise (except adding more starchy flavor to the equation, which I found after multiple experiments just takes away from what’s inside… you have to compensate by adding more filling to balance it out). Due to that finding, the second time I made a batch I tried folding over the peaks – at least this way, guests wouldn’t need to stab themselves to enjoy the dish. That fixed one problem, but not the unbalanced starch problem. Round gyoza wrappers = problem solved! There’s far less dough to deal with, and when pressing them into the pan they naturally don’t make any jagged peaks. You have to worry less about the vehicle and more about the filling, which is how it should be. At some point, I’ll replace the images in this post with gyoza wrappers. Gently press one gyoza wrapper into each section. The sides will naturally start to form ‘peaks’ – press down lightly on the base and then around the sides to form a smooth(ish) shape. It’s ok if they are uneven – unlike pie crusts, wonton wrapper cups won’t billow out or ruin themselves if you don’t weigh them down or make them perfect. You can make these ahead of time and then store covered or in a tupperware to avoid them getting stale or overly-hard. I usually make the cups ahead of time and then spoon in the filling shortly before they’ll be eaten. Note that even with a saucy filling, these don’t get soft or ruined quickly – I’ve tasted them hours into a party and they still taste delicious. Two easy recipes are coming soon in future posts! If you try out this recipe and come up with an interesting filling, definitely share it here! 5 Comments on "Baked wonton wrapper cups – the perfect base for party appetizers"
I haven’t tried this yet but I was looking for an easier (and healthier) way to enjoy crab rangoon. My friend and I thought just have the filling be a dip and fry the wonton wrappers like chips but then I thought about baked wonton wrappers, did a search and found your post. So thank-you for the idea of crab rangoon cups! I just looked at the name of your blog. Sorry about my previous post. I feel like a jerk now. Sandy, no need to feel like a jerk! It’s the “occasional” vegan for a reason I’m not vegan, my husband is, but I like experimenting with vegan stuff to try to meet in the middle. These cups would certainly work for a boat-like version of rangoons I’m sure. Make sure to use the gyoza round wrappers as it’ll mean less wrapper and more filling! Let me know how it turns out! I know this is years later but I had to add a comment on this. I could not find gyoza in my store – just regular square wontons – so I cut the corners off to make them a little less “pointy”. The oven “frying” worked beautifully with the cooking spray! I filled them with a combination of goat cheese & cream cheese and topped with hot pepper jelly. Yum! I wonder if molding them onto an upsidedown muffin tin would cook them more evenly….